Any time I’m frustrated with Oscar’s stubbornness or selective hearing, the sight of him napping is a reminder of why I’m so in love with him. When he naps, his bottom lip sticks out which is incredibly adorable. When he’s really sleepy, his tongue will even hang out a little. Watching this guy sleep so peacefully always makes my day brighter. Sleepy Oscar with his bottom lip stuck out. Oscar asleep with his tongue out. Hi there. 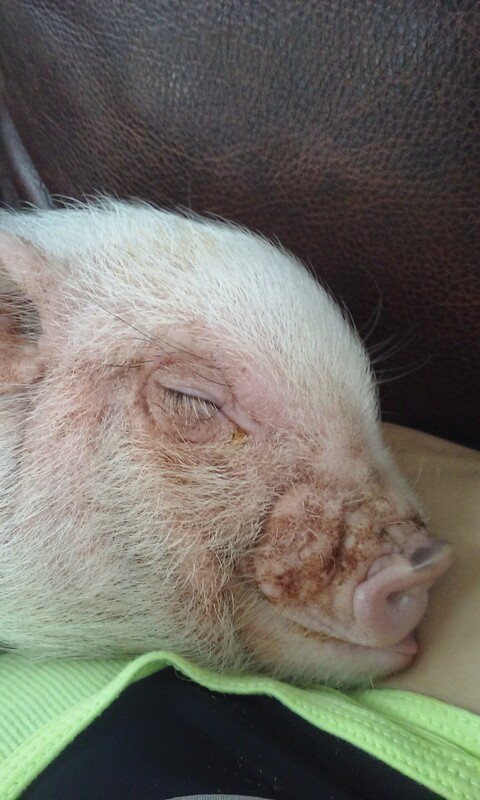 I noticed that Oscar has yeast (that orange colored stuff on his nose and face) that lots of pigs have. 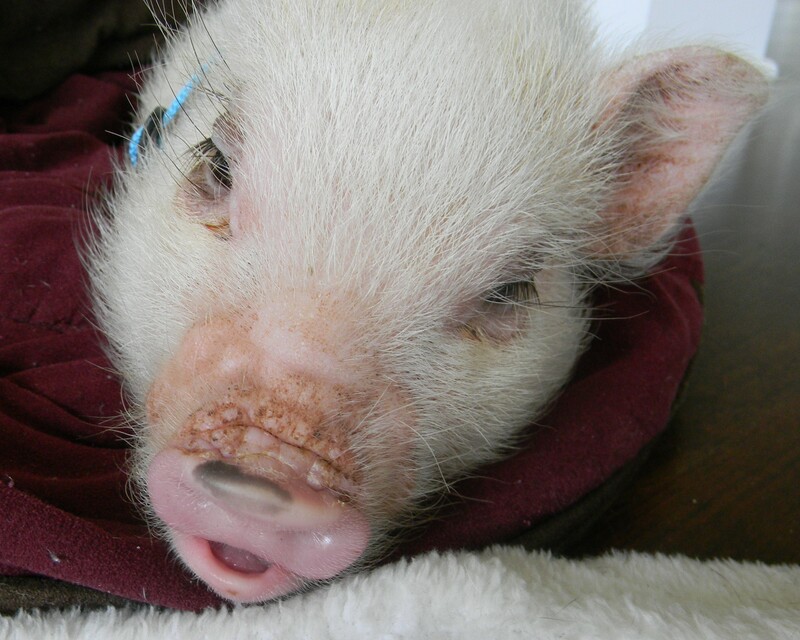 My baby pig came home from the breeder’s with it too. I noticed all her pigs had it, but she told me it was something common and not to worry about it. I took my baby right to my vet, and she told me that yeast is very common in pigs but it is definitely not normal and can easily be cured. If not remedied, yeast can cause permanent hair loss and bad ear infections (which my piggy had.) Anyway, you can get an ointment from your vet that will quickly get rid of the yeast. Although it’s for ears, you can use it anywhere on Oscar’s body. Be sure to check everywhere on him too. He can even have it on his legs and especially his ears. Anyway, I hope you don’t mind my bringing this to your attention. BTW.. my baby has a lower lip and chin that sticks out too. Don’t you just love that sweet little expression? 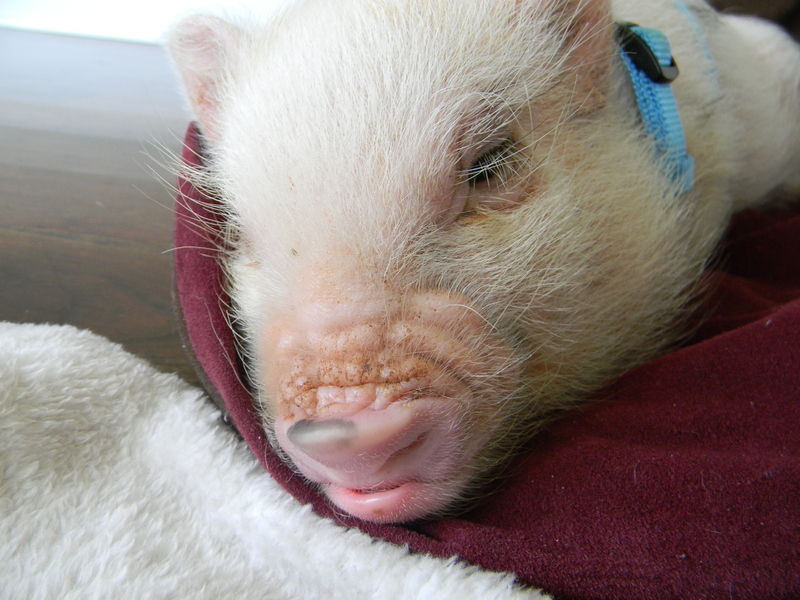 My Micro mini pig has that same lip! It’s the cutest thing, especially when his tounge comes out! He’s the funniest little thing , and I love when he yawns!